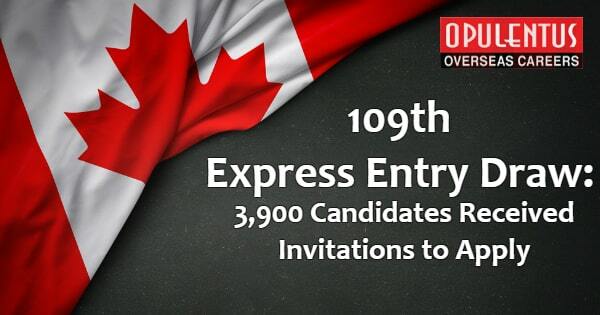 The Canadian Government conducted its 2nd Express Entry draw of 2019 on Jan 23, announcing 3,900 invitations to apply for Canada PR to applicants with ranking scores as less as 443. Canada has now declared 7,800 invitations to the applicants in the system of federal Express Entry since the commencement of 2019. It is the most ITAs announced as of Jan 23 since Express Entry was launched in 2015 to maintain the pool of applicants for 03 Federal High Proficient economic immigration categories of Canada the Canadian Experience Class, Federal Skilled Worker Class, and Federal Skilled Trades Class. Applicants for these 03 categories are listed depends on the scores given for factors such as education, age, work experience and knowledge in English or French and a fixed number of the candidates with highest-score are invited to appeal for Canada PR by general invitation rounds. For achieving the bigger targets, it is assumed that IRCC will have to announce numerous ITAs throughout this year than ad it did in the year 2018, which marked IRCC issue its maximum invitations in a particular year. The least score of Comprehensive Ranking System in this current draw was 06 points beneath the minimum score in the initial draw of 2019, which conducted on January 10. Current Draw score of 443 was the weakest score yet for a Jan draw by the Express Entry system. A provincial nomination by Provincial Nominee Programs of Canada is one more popular choice for Express Entry applicants looking to improve their scores. A provincial nomination by an Express Entry-associated PNP stream results in an extra 600 CRS points, which ensures an invitation to apply for Canada PR. Express Entry P.N.P streams in Saskatchewan, Ontario, British Columbia, Manitoba, and Prince Edward Island have been running in this month. Stay Updated with our newsletters to get the recent updates and information on immigration and visas. We are pleased to announce that we have served more than a Lakh of happy customers. We request you to fill up the free assessment form presented by Opulentus to take the initial step for your Visa and Immigration Process.